Whoâ€™s excited about homemade sushi that doesnâ€™t take over an hour to make and leave behind a sticky mess with tons to clean? ðŸ™‹ðŸ�» These raw, rice free, completely plant-based cucumber alternatives are so much healthier than the real thing and are completely no-fuss! They take just about 5 minutes to make and thereâ€™s no nori involved to scare away those leery toddlers. This is the perfect lunch or snack to satisfy the whole family! Thereâ€™s also a ton of room for creativity with these. They make a great veggie appetizer for a party or dinner partyâ€”instead of serving chips with your guacamole, try putting it in a cucumber instead. Want to fancy them up a bit for a party? Instead of topping the avocado with julienned veggies, sprinkle over some toasted sesame seeds and a drizzle of sriracha. If you arenâ€™t into radishes or carrots, replace those with something else like zucchini or bell peppers. Not a fan of guacamole? Fill your cucumbers with hummus instead. The possibilities are endless, but fun nonetheless! Cut cucumber into 8 approximately Â¾ inch to 1-inch thick rounds. Using a melon baller, scoop 2/3 of the center out, leaving the bottom in tact to hold filling. Cut an avocado in half and scoop half into a bowl. Season with the juice of half a lime and salt and pepper to taste and mash together with a fork. Cut carrot into 4 approximately 1 inch chunks. Then carefully cut each chunk into fairly thin slices longways. Then cut each slice into strips. Slice radishes into fairly thin slices. Then cut each slice into strips. Using a teaspoon, scoop 1 spoonful of avocado into each cucumber round. Top each with some carrots and radishes. 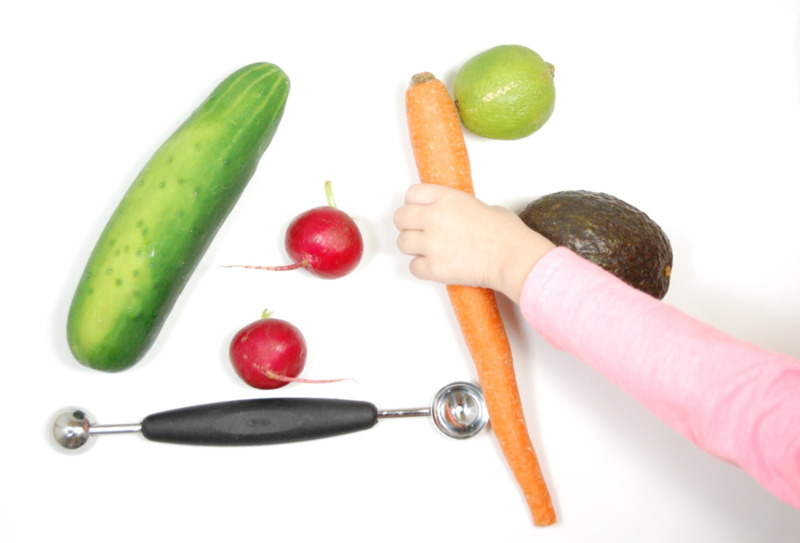 Your toddlers can get so involved in this recipe! Let them make the avocado filling by mashing the avocado, squeezing the lime into it and seasoning it with salt and pepper. Let them spoon the filling into the cucumber rounds and top each one with the veggies of their choice!